Exposure to pollutants in the air (like secondhand smoke) can directly affect health status and is linked to premature death, cancer, heart disease, and respiratory disease. Globally, nearly 25% of all deaths and disease can be linked to environmental factors. Children’s exposure to secondhand smoke by health insurance status. 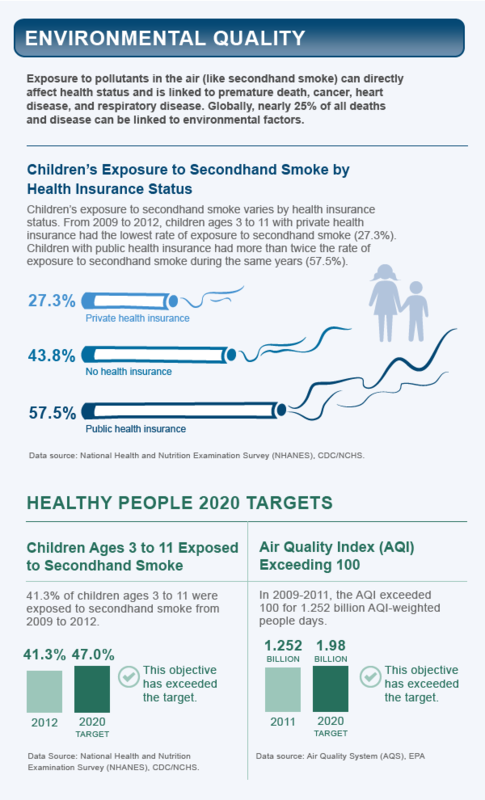 From 2009 to 2012, children ages 3 to 11 with private health insurance had the lowest rate of exposure to secondhand smoke (27.3%). Children with public health insurance had more than twice the rate of secondhand smoke exposure during the same years (57.5%). 41.3% of children ages 3 to 11 years were exposed to secondhand smoke from 2009 to 2012. In 2009-2011, the AQI exceeded 100 for 1.252 billion AQI-weighted people days.